For those looking to visit small medieval towns, a day trip Vienna to Cesky Krumlov in the Czech Republic is a must. 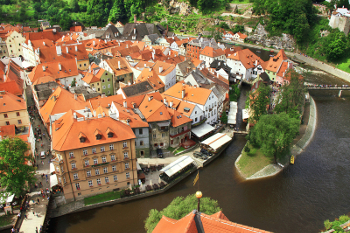 A UNESCO World Heritage site since 1992, Cesky Krumlov is one of Bohemia ́s most picturesque towns, made up of stunning Renaissance buildings housing charming pubs, restaurants, cafes, shops and many galleries. Along the way you can sit back and enjoy the beautiful countryside of the Waldviertel (forest quarter) in northern Austria. After arriving in the fairytale old town of Cesky Krumlov, your local guide will show you all the highlights of the city. Explore the narrow and romantic streets of the renaissance Old Town, featuring 300-year old medieval buildings, enjoy views from a footbridge over the Vltava River and walk by the Egon Schiele Art Centre.From the Regional Museum there are beautiful views of the medieval centre. We will also visit Saint Vitus Church and the town square with its Renaissance town hall, plague column and fountain. Then it is time to visit Latrán Street with its colorful, medieval houses. After entering the first castle courtyard and seeing the bear moat where bears actually live, you will tour the second biggest castle in Bohemia. While touring the Old Town, for lunch we will dine at a traditional restaurant near the Vltava River, which offers magnificent views of the castle, particularly in summer. In the winter we dine at a cozy, medieval-like restaurant with a fireplace, located in one of the romantic, cobbled streets. Do not forget to savour the local Eggenberg beer. The highlight of the town, the Castle of Cesky Krumlov, attracts visitors who come from all over the world to marvel at the architectural gem with five courtyards and 11 hectares of gardens. In 1302 the Rosenberg family inherited the Cesky Krumlov Castle, which was their main residence for nearly 300 years. You are sure to be dazzled by the golden carriage. Constructed from gilded walnut in 1638, the carriage was used to transport gifts from the newly-elected Emperor Ferdinand III von Habsburg to Pope Urban VIII. Cesky Krumlov Castle also boasts one of the oldest Baroque theatres in Europe, built from 1680 to 1682. It is one of only a few Baroque theatres left in the world. Free time to explore and enjoy lunch on your own. Drive through the charming Austrian countryside.